Pioneer Foundation Nepal (Non-Profitable Organization - www.pfnepal.org) has conducted volunteering teaching in many places in Nepal. 1) Volunteering Teaching in Kathmandu. Details for Volunteering in Government School, Kathmandu . Kathmandu is the Capital city of Nepal, which is more developed to compare of the other cities in Nepal, but besides of this Metropolitan city, there are many rural areas & many schools, which are owned by Government, but having lack of education systems, lack of many infrastructures. So, Our Pioneer Foundation focused in this backyard areas for the school, orphanage house volunteering & stay. Shree Mangoladaya School, Thankot, Kathmandu. 20 KM far from the Kathmandu International Airport, 11 KM far from the Thamel, which is just 25 minutes drive from the Thamel & 40 Minutes drive from the International Airport. Our Volunteers Home stay is in Dahachok, Khahare Bus Park. Schools are located 10 – 15 minutes walking distance from the Volunteer’s Home Stay. Toilets, Sports materials, grounds, Science Lab, School offices and Library are in weak conditions in first two Government schools. All teaching methods are in Nepalese Medium, except English Book in Government schools but in West Point School, Teaching Method is in English. 15 permanent Teachers, fully paid by Nepal Government schools & West Point School paid their private teachers. Volunteering need for English Teaching, Sports teaching, Health, Social and environments, Computers classes etc. 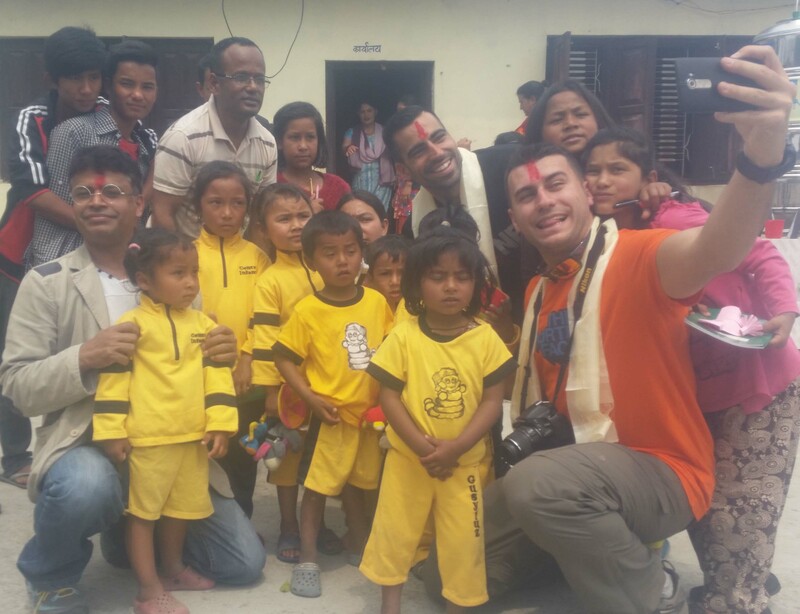 Volunteers also assist and help for the student discipline learning, health awareness, socio –cultural exchange of his/her country & Nepal. Besides of these, Volunteers can interact with Parents, Teachers as well as students about their life styles, culture, traditions. Per Day Volunteering: US $ 32 per person per day (This will includes, lodging, food, volunteering fees in Schools . Transportation in/out to the Chandragiri- 02, Khahare Buspark, Dahachok from Kathmandu international Airport & Major Hotel from Thamel will cost 30 $ by private Car/Jeep. You have to sign up for minimum of 02 days volunteering teaching. But if you could do more days for volunteering in School, it would always be perfect. You could sign up for 1week, 2 weeks, 3 weeks, 1 month or more volunteering teaching in these schools but you have to confirm your timeline of volunteering beforehand. On your volunteering program, lodging will be at “ Dahachok Volunteer Home Stay” . ( www.dahachok.com) So it is an experience to live together with Nepalese family, which gives you antique opportunity to enjoy, explore and interact with the local peoples, their lifestyles and culture. You will get one double/Twin Bedded or Triple bed room for your staying in volunteering and toilets are outside the room. Hot Shower will be available. 24 hours free WiFi internet also available. You will have basic food. As it is a home stay, you would not have much choice of western food (But you could buy some noodles, spaghetti, cheese, Salads, Meat items etc, which you can buy from the shops near this Home Stay. If you wish to Prepare your own food, we will provide you Private Kitchen, which is available in this Home Stay. Nepali Food Set (Dal Bhat Veg set ) - which is combine with plain rice, lentil soup, Vegetable curry, Gundruk Sadeko (Kimchi) or pickle etc. We will also provide you Free popcorn & Tea. While on Volunteering teaching in school, you will have opportunity to see how school is running, discussion about teaching difference in your country and in Nepal, interact with social peoples, teachers and school management, paying sports with school children's. DAHACHOK is a historical place, which is situated 11 Km west from the central of Kathmandu city, Thamel. From this volunteer Home stay, you can visit to cultural villages, historical areas such as Martyr Kalu Pandey’s Cemetery, Historical Indra Daha, Hiking in the Dahachok Hill, 2100M Elevation, from where you can explore the 360 degree panoramic views of the snowcapped mountains such as Mt. Manasalu Ranges, Ganesh Himal Ranges, Langtang etc. Our Local guide will assist you for your Day Hiking and other excursion along with this Volunteering. only for a required lodging/food/school exp. for your staying during the trip. However when you will be there, as school was affected from earthquake and they almost have no good set up of anything in their school (We initiating fundraising to this school for basic support to assist them), school always have expectation from westerners to get more support on their school, thus it is always a best to assist school from your side to enlighten them more from your visit. You could campaign for fundraising for their school for making science laboratory, library making, buying cupboards, tables, chairs, teaching posters, digital teaching DVDs etc. or assisting on sports such as, buying footballs, volleyballs and nets, badminton, table tennis, cricket etc. We know that fact that everyone could not do much, but you may assist on anything that you could to support them on your trip to their place. You could even do very small support such as, buying some sports materials, buying colors and pencil or textbooks or examination copies etc., which do not cost more then US $100- $200 but this would also make them feel very good! If you want to support anything, you could buy each and everything in Kathmandu to take with you. You can sponsor a child for his/ her school education. You can support by these ways. If you pay USD 150, it will support a child for his/her whole one year school fees & Stationary in a Government school. If you pay USD 1350, It will support a child for his /her whole one year tuitions fee, School dress, Exam fees, Books and other stationary, Hostel fees, All Foods ( B,L,D) in a private school.